People’s Liberation Army Sr. Col. Dai Xu is gaining media recognition for spreading American conspiracies against China, according to the Washington Times. The Washington Free Beacon’s Bill Gertz reported that Dai recently accused the United States of releasing the H7N9 bird flu virus, which is inflicting the Shanghai area, as an act of biological warfare. State Department spokesman Jason Rebholz dismissed the claim. "There is absolutely no truth to these allegations," he told the Washington Free Beacon. Seven deaths from the bird flu outbreak were reported as of Tuesday in state-run Chinese media. 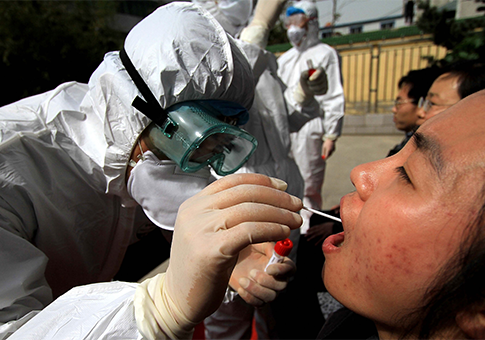 As many as 24 people reportedly were infected by the disease in Shanghai, Jiangsu, Zhejiang, and Anhui. Manufactured the 2008 financial crisis to steal China’s and other countries’ money. Wants to trick Russia into launching a nuclear war against China that would destroy both countries and assure a U.S. triumph. This entry was posted in National Security, Politics and tagged China, Media, PLA. Bookmark the permalink.